Lindsay Mitchell has been doing some digging and come up with some interesting information regarding benefits and who should and shouldn’t be on them. She has given me permission to repost her information in the interests of giving her a wider audience. I have found the following information enlightening…especially as it appear to show that over 10% are abusing their benefit. We all know that there are plenty of people pulling a single parent benefit who have partners. Anecdotal evidence aside, there are two data sources pointing to this. One is the Growing up in NZ study, which I wrote about here but it gets quite complicated. (After an MBIE refusal to release the paper to me, the matter currently sits with the Ombudsman). Back in October I blogged about a trial mentioned in the MSD Annual Report. I have asked for more information under the OIA. On Thursday some data was released to me. The trial is conducted on single parent support beneficiaries because this is the only benefit that has relationship status a requirement for eligibility. 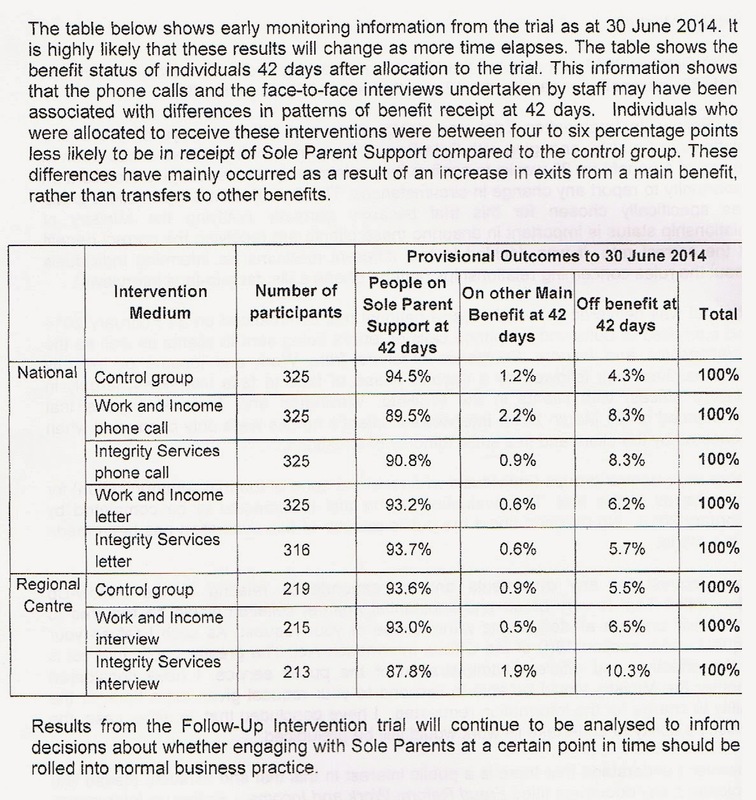 The participants were those who had been on Sole Parent Support benefit (SPS) for 20 weeks. A National group was selected, and a regional group covering Taranaki, Waikato and Wellington. Naturally a control group (which received no follow-up intervention) was also randomly selected and I am assuming these individuals had also been on SPS for 20 weeks. The 10.3% is remarkably similar to the findings after matching HLFS data and WINZ records referred to above. There is every chance the real incidence is higher. I say that because the trial only covered people who had been on SPS for 20 weeks. I suspect the likelihood of having an undeclared partner grows with time rather than decreases but I may be wrong. Quite. It is not for lifestylers who produce meal ticket children because they can’t be bothered supporting themselves.